A walking tour of the ivy-covered grounds of historic Keeneland Race Course, home to the planet's most expensive horse auctions. A peek into the thoroughbred horse lifestyle as we go behind the scenes to explore a thoroughbred farm and visit up close and personal with their famous horses. We’ll even see where scenes from the major motion pictures Secretariat, Seabiscuit and Dreamer were filmed. 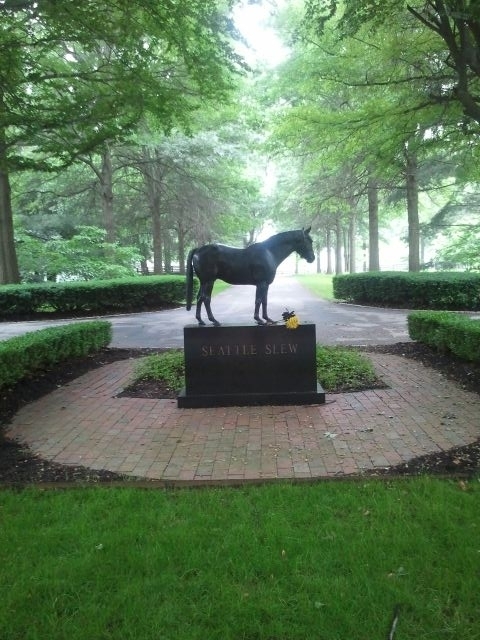 To top things off we will visit Hill & Dale to see the grave site of Triple Crown winner Seattle Slew. Tours may vary depending on farm availability. In the afternoon since no horses are working out at Keeneland we may do another horse farm instead of Keeneland. During the off season (mid November through mid March) ticket prices and ticket minimums may vary depending on the number of people booking the tour. See our FAQs for details. Our primary hotel pickup location is the Embassy Suites Hotel in Lexington. We pick up at the Embassy Suites Hotel at 8:30am and 12:30pm. In addition to our primary location we also offer the option to be picked up at one of our other partner hotels (only if you are staying there) such as the Hyatt Regency Hotel, Lyndon House, Marriott Courtyard North, Marriott Griffin Gate, Clarion, Fairfield Inn (Lexington North), and Sheraton Four Points. If you choose one of these alternate hotels, you must be ready for pickup 20 minutes before your tour's start time. However, you may be picked up anywhere from 5-20 minutes prior depending on how many pickup points are needed for the tour you selected. You can select your pickup location when purchasing your tickets. Note that if you are driving the Embassy Suites has a large parking lot where you can park for free. We reserve the right to change alternate hotel pick ups to the Embassy Suites if there are too many pick up locations for a specific tour. Pricing may vary during peak times (such as the Kentucky Derby) and during the off season (from mid November through March 31st).